Arcade games offer endless amusement and entertainment, but they aren’t as popular as they use to be and they don’t offer the potential for large payouts like real money pokies do. Enter Arcader, ThunderKick’s exciting pokie based on popular arcade games, while incorporating a classic fruit machine feel with modern features too. ThunderKick are fairly new to the iGaming scene – employees from the popular provider NetEnt branched out in 2012 to launch ThunderKick games. They’ve quickly made a name for themselves by offering a catalogue of unique pokies, including Arcader. Arcader is a 5 reel and 15 payline pokie, featuring a retro theme from the moment you click on the title. The reels appear and a technologic voiceover says ‘welcome back’ which is quite reminiscent of Pinball, Tetris, and other arcade games we’ve played time and time again. Then the exciting arcade soundtrack starts up and we are treated to reels which aren’t perfectly aligned, making them appear more like a grid than reels despite being the latter. The minimum bet available is $0.20 and the maximum bet is $100, offering quite a large range of betting options for players. Additionally, the theoretical RTP is 96.1%. The arcade/video game theme is executed well by ThunderKick thanks to the modern HD graphics and technologic soundtrack. ThunderKick keep their layout simple, even for desktop devices, with the spin symbol resented by the two arrows, the bet size represented by a chip, and an autoplay option represented by the play button symbol. There’s also the option to mute the audio via the audio symbol in the bottom left hand corner, though this will detract from the arcade ambience. 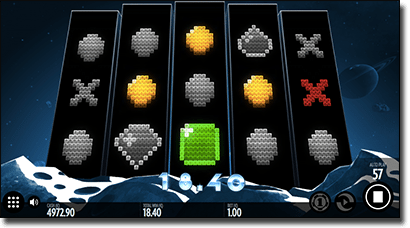 Additionally, you can view the paytable and the rules of the game by clicking on the nine dots symbol and then the trophy and the document symbols, respectively. The paytable is a bit annoying to read however, with a vertical scroll function all on the one page, instead of the usual horizontal scroll function. 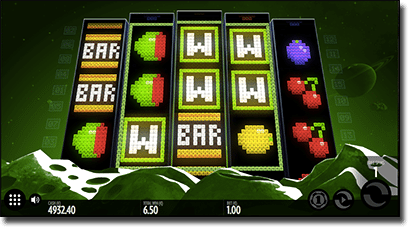 The symbols are what we love about this pokie – ThunderKick utilise the old school fruit machine symbols, craft them to suit an arcade themed game by pixelating them (reminiscent of Pac Mac), and execute them in High Definition. The lower paying symbols include the cherries and the oranges, with the payouts dependant on your bet size – though you can win up to $100 and $150, respectively, by spinning five of each (at max bet). The middle value symbols include the grape, the lemon, and the strawberry with the latter symbol paying the most – up to $300 (with max bet). The higher paying symbols include the Liberty Bell, the 7, and the BAR symbol, with the latter symbol scoring you the top payout, of up to $2000 (at max bet) by spinning five. But these aren’t the only symbols to keep your eye out for, with an array of Wild and Bonus symbols offering special payouts and triggering features. Wild: The Wild symbol is the ‘W’ symbol which glows blue. It substitutes for all symbols except the Bonus, the Expander, and the Mystery Bonus symbols to complete a winning payline. Bonus Symbol: The Bonus symbol is the green ‘B’ and at least three activates the Bonus game. The number you spin determines the multiplier value applied. The Expander: The Expander symbol is represented by the two triangles directly opposite to one another, and it expands to create a whole row of the same symbols to create more wins. Sticky Wild: Appears in the Bonus game and substitutes for all symbols. Mystery Symbol: The Mystery symbol is the pink ‘M’ and at least three activates the Mystery game, with the number you spin determining the multiplier applied. As you can see there’s quite a few symbols you need to take note of, but this just means there’s a lot of bonus features you can activate. There’s also the chance to land Sticky Wilds on reels 2, 3, and 4, which will remain for all of the free spins. There’s also a Mystery Bonus game which is triggered by at least three Mystery Bonus symbols and here you will see the entire reels covered in question marks for you to pick and reveal a cash prize. Payouts are dependant on your bet size, and you can win up to $10,800 by matching the symbols and playing the maximum bet, but keep an eye out for the ‘X’ symbol which will end the game instantly. ThunderKick has the old school feel on point, but there are still some incredible and modern features included on Arcader to please all types of players. On any win, the reels light up and flash similar to an arcade game and although it took us a while to trigger any of the bonus games, it was well worth the wait since we scored seven Sticky Wilds during the nine free spins, and a substantial payout compared to our bet size on the Mystery Bonus game. You can play this title on your desktop, laptop, smartphone, or tablet, at our number one site for pokies www.SlotsMillion.com.